Colorado Rural Electric Association | Could Allam Cycle Be a Cleaner Solution for Colorado’s Electric Co-op Coal Plants? Could Allam Cycle Be a Cleaner Solution for Colorado’s Electric Co-op Coal Plants? The U.S. Environmental Protection Agency’s Clean Power Plan raised more questions than answers since the rule’s finalization in August 2015. Basin Electric Power Cooperative, a not-for-profit generation and transmission cooperative that provides supplemental power to rural electric cooperatives in nine states, including Colorado, has an energy portfolio that includes coal, gas, oil, nuclear, distributed and renewable energy. With nationwide focus shifting toward renewable energy, Basin Electric’s leadership understands the cooperative must evolve to continue growing in a carbon-constrained world. 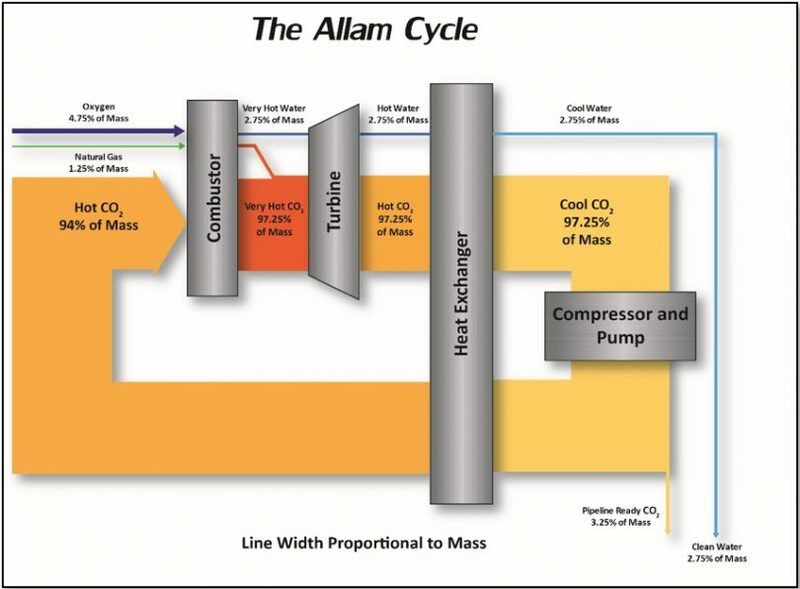 One technology that is flashing economical carbon-reduction potential is the Allam Cycle. The vision for the Allam Cycle consists of gasifying lignite coal to produce synthetic natural gas, which would then be used along with oxygen and carbon dioxide to drive a turbine generator. This working fluid is then cooled through a heat exchanger and water is separated from it to create a nearly-pure CO2 stream. The CO2 stream is pressurized and a majority of the flow is fed back to the combustor as the working fluid to begin the cycle again. The remaining part of the CO2 flow is collected and put into a pipeline without increasing the power plant’s cost of producing electricity. The technology could provide Dakota Gasification Company another source of marketable CO2 to be used for enhanced oil recovery or other purposes, and provide Basin Electric a more efficient and CO2 emission-free way of generating electricity using lignite coal. Jim Sheldon, Basin Electric senior research and design engineer, heads the cooperative’s Horizons Committee. The group is responsible for monitoring and disseminating information regarding major environmental issues and new technologies — one being the Allam Cycle. “This cycle uses CO2 as the working fluid instead of water, which we currently use in our coal plants. The first advantage is the dramatic efficiency gain using CO2 since it stays in the vapor phase instead of changing from liquid to vapor and back,” Sheldon says. To research further development of Allam Cycle technology and its use with lignite coal, Basin Electric; the Energy & Environmental Research Center; 8 Rivers and ALLETE, Inc., along with ALLETE subsidiaries BNI Coal and Minnesota Power, were granted $1.48 million toward the total $3.18 million one-year research project. Basin Electric and ALLETE also committed to contributing matching funds and in-kind services supporting the work. A first-of-a-kind plant using natural gas will start up in Texas in 2017, along with a more in-depth study using lignite to make synthetic natural gas in North Dakota. Basin Electric will monitor the technology’s development and participate in the North Dakota study. “If the first-of-a-kind plants prove out the initial work, this technology could be an economical means of using coal in a CO2- and emissions-constrained future,” Sheldon says.